There are certain ways in which my daughter can outsmart a smartphone. Technically, she was a Google App before Google or apps were invented. For example, I could use the Gift app on my phone to record who bought which Christmas presents (to help the kids write their thankyou notes). But I tend not to bother, because my daughter can remember - much more speedily, and in much more detail - where every single toy in the house came from, who bought it for her or her brother and how old they were when they got it. Number facts are her favourite. She may only be able to recite a few of the very easiest times tables off by heart, but her brain does manage to store an awful lot of other kinds of numerical data. The way she observes, stores and calculates this information may not follow traditional mathematical paths of logic, but it works. She’s really good on dates. Earlier this year, exactly 12 months on from the day we moved home, it was her that pointed out it was our “new house anniversary”. And then there’s her ability to recall people’s ages, birthdays, and their shoe sizes. Which, as you can imagine, comes in especially handy if I’m planning to buy anyone age-appropriate shoes for their birthday. So, thanks, data-daughter, for the reminder. And thanks, Mr Drakeygirl (age 47, shoe size 10), for your years of long service. And there’s nothing I like better than a long servicing. Christ alone knows where my confidence came from: I was always the friend of the prettier girls blokes wanted to walk home, the ‘mate’ who fellas wanted to have a drink and a laugh with but never fancied. But he just had walk me home: it was going to happen, and it did. He’s been my home ever since. My daughter has been googling. With presents in mind. I don’t think I’m a scary woman. 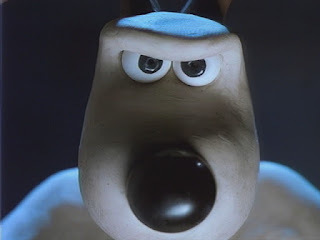 I have a burly chassis, but I’ve got a friendly face. However, I think I might have just frightened a teenage boy witless (admittedly this is a state that may be hard to measure empirically). All week, I’ve been walking my daughter to her new class at the special school’s unit at the big mainstream comp. It’s a slightly odd experience, because - unlike at her old school site - there are no other parents doing this. Why would they? All the mainstream kids are trusted and expected to get themselves to school with varying degrees of enthusiasm. The handful of pupils in my daughter’s special needs class are all transported there by taxis or minibuses, as they live further away than us. We’re just around the corner, about a quarter of a mile away, and because of her learning difficulties and tendency to switch off and daydream, she’s just not safe and aware enough of traffic on the busy road. I walk with her, a lone adult in amongst a sea of teenagers. So this morning, with my hyped up three-year-old scooting along behind us, occasionally scattering slower-moving youngsters as he went, something happened. It was a tiny incident, but my instinctive reaction surprised me. My daughter was a few paces ahead of me. My son whizzed past on his scooter. I was now a little way behind, and not obviously ‘with’ either of them. My girl was doing her funny, wobbly-headed, flappy armed little walk, which was getting some double-takes from a group of teenage lads who ended up beside her. “Don’t go too far!” she yelled to her brother, in her best declamatory robot voice. “Don’t...don’t...don’t got too far, don’t go too far, don’t go too far!” she repeated. The group of lads next to her looked at eachother, sniggering. One of them whispered something to his mate and they shot her a few more glances, laughing loudly. Now, I can understand them giving her a second glance, because her actions are sometimes slightly odd. Walking along in her new uniform, she looks like any other teenager, but of course, she is different in some ways. 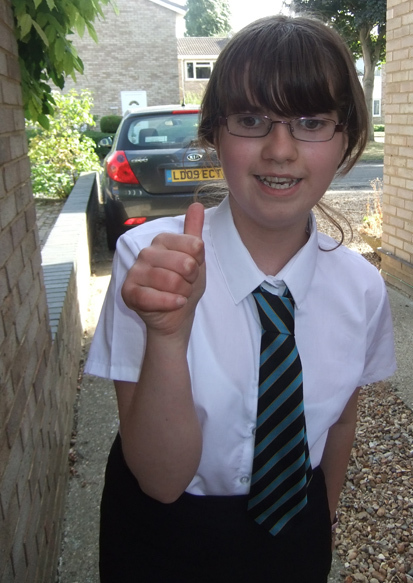 There’s no badge for this - her syndrome and how it affects her isn’t at all obvious at first glance or at face value. They hadn’t said anything to her, they hadn’t called her any names, but they’d twigged that she wasn’t exactly like them, and found her behaviour and demeanour funny. This is kind of understandable. It’s kind of what you’d expect, and being generous and giving them the benefit of the doubt, it probably wasn’t cruel. She was walking in a funny way and talking in a funny way, and they had a laugh about it. What I didn’t realise was that even though all these reasonable thoughts were going through my head, my face was telling a different story. One of the young lads, turned, mid laugh, to clock me walking just a few paces behind. I stepped up, and put a hand on my daughter’s shoulder. She was still loudly calling for her brother to slow down and let us catch up, and was completely oblivious to the fact she’d been the subject of laughter. I shot a quick look at the lad, whose laugh had died out as he realised I was the ‘odd’ girl’s mother. I’m not aware of harbouring any violent thoughts towards him, after all, all he’d done was have a little laugh behind someone’s back. Let’s face it, that’s a major hobby for most teenagers. So in my head, I was thinking: “No big deal.” Only by the terrified look on his face, my countenance must have been transmitting a different message. I think my monstrous protective instinct may have trampled all over my reasonable thoughts and, without me being aware of it, showed on my face, bared its fangs and roared at him. 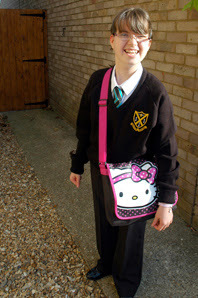 My daughter started at the local comprehensive school today: a big, imposing, building with 1300 pupils in it. It would have been a daunting enough day for any other 13-year-old. But for a girl with special needs, in amongst a sea of ‘mainstream’ students, it was a bit of a leap of faith. I held her hand and walked alongside her, through the crowds of bleary-eyed teenagers, many still in British Summmer Holiday Time, their bodies in shock at having to get up before noon. I was, of course, the only mum doing this, which felt really odd compared to the motley bunch of us that used to turn up with our offspring at the doors of her old special school. My daughter, thankfully, was oblivious to this fact. Mainstream didn’t work for my girl after the age of about seven. She was lost in a sea of pupils that were quicker than her at almost everything. When we recognised it wasn't working, we moved her to a special school, where the teaching was done in small, well-staffed groups. And she's been in a special school environment ever since, where she’s thrived. Yet now, here we were, walking into a mainstream secondary. Had we done the right thing? Well, things aren’t quite how I’ve made them seem. Despite being decked out smartly in the mainstream school’s uniform, really she is still part of her old special school, and is being taught in a small, specialist, tightly-supported ‘satellite’ class. Although the unit is part of the widespread policy of ‘inclusion’, it’s actually pretty self-contained. To all intents and purposes, it is a miniature special school with just six pupils in her class, supervised by one teacher and two teaching assistants, who also accompany the group at break and dinner times, keeping a watchful eye on them when they come out of the safe cocoon of their own little learning world. So we have taken the plunge, and this morning, for the first time, I took a deep breath, gave my daughter her last few words of encouragement as her teacher met her at the gate, and watched her disappear inside. In her smart jumper and tie, clutching her Hello Kitty bag, she somehow looked incredibly tough and grown-up but incredibly young and vulnerable all at the same time. Then I took Dennis The Menace to nursery on his scooter. Then I went home to worry. Just under seven hours later, I picked her up, trying not to inhale the exhaust fumes of the school buses, and squeezing past the lanky, bumfluff-lipped sixthformers, leaning casually on their mopeds. How had she found the day? How had she coped (particularly when, although closely supervised, her little group of ‘different’ classmates would have come into contact with the wider school cohort)? She walked towards me, chatting to her teacher, her hair swept up into a glamorous pony-tail that put my morning's amateur scrunchie-grappling to shame. I smiled, thinking how nice it was that her cousin, without any prompting from me, had taken it upon herself to seek out my girl. “So what did you think to it?” I asked, searching my daughter’s face for clues to her mood. My daughter and I spent a wide-eyed day of wonder at the Olympic Park, watching Paralympic athletes competing in the Olympic Stadium. My girl, with her poor muscle tone and her tendency to tire easily, climbed three flights of stairs to get to her seat, high up in the gods. And watched four hours of competition. Her obsessive worries about things being “too noisy” and music being “too loud” were forgotten. She didn't mind the PA system broadcasting snippets of tunes from such varied sorts as Tom Jones, Elastica, and rather surprisingly Joy Division. "It's fine. 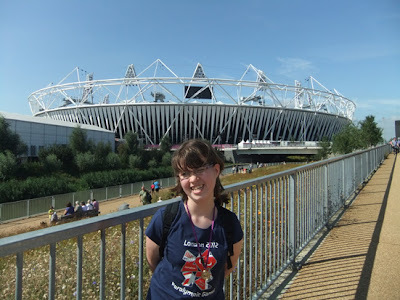 It's not hurting my ears," she assured me, as we took part in a Mexican soundwave of a cheer rolling round the stadium as it followed the athletes racing around the track. She peppered me with questions, taking it all in, shyly copying the cheers of those around her, her volume rising from an initial whisper to a loud shout. There were thrills, and literal spills: a Ukranian wheelchair racer tipped over as he crossed the finishing line, then decided to do a one-armed bench press with his chair a few times from his prone position on the track, seemingly just for the hell of it. There were medal ceremonies for shot putters and javelin throwers, with the entire crowd cheering stirring anthems from countries all over the world. Thousands upon thousands of noisy and excited spectators remained impeccably silent (as instructed by the commentator) for the visually impaired long-jumpers, who needed to hear their coach’s voice to determine the direction and duration of their run-up before they hit the board and flew through the air. We did give an appropriately huge roar of approval once they hit the sand, of course, although perhaps the biggest hurrah was aimed at the Chinese long-jumper, who whipped his bright yellow (velcroed?) tracksuit bottoms off with a deliberately theatrical flourish not seen since Bucks Fizz did Making Your Mind Up in the Eurovision Song Contest. 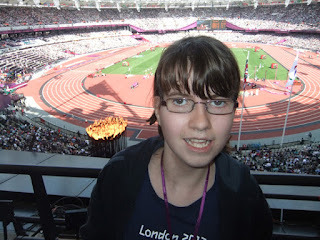 The shimmering Olympic flame, housed in that elegant cauldron, was right below us, some distance down, in a lower tier. My girl’s face seemed to me to be giving off a similarly golden glow. Tactical snacks kept her happy until lunchtime, when, unbelievably, she voted for us to stay and watch the last hour rather than nip out for dinner and come back. “I’m hungry, but I want to see it all.” That right, there, is the supreme ringing endorsement for an event from a child with Prader-Willi Syndrome and an insatiable appetite - an event so good you’ll put your dinner on hold for it. Of course, we hit McDonald's (as she'd made me promise) as soon as the session finished. The dreaded Maccy D's is a special treat, but not as calorific as it sounds, as she has chicken nuggets and a fruit bag instead of chips. We sat on a park bench in the blazing sunshine chatting to yet another friendly family - one of scores of similar sociable encounters with strangers throughout the day. We walked a lot. We talked a lot. She clutched her programme to her chest and had a nap on the final train leg of our journey home. That evening, she hit her pillow with a thump, worn out but happy. I shut my daughter’s bedroom door, and as I turned and walked down the stairs, I heard her call out. I smiled to myself, and called back that she had better get some sleep then. I received a muffled giggle in reply. A day that ends on a giggle is a good ’un. This was more than good. It was spectacular, and I don't think we'll ever forget it. Video is Elastica - Connection. A huge thank you to Martin Simmonds (@martsimmonds) and his lovely family for kindly putting us up the night before and saving us having to catch an unfeasibly early train.